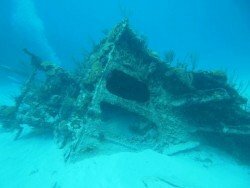 Bermuda is regarded as the wreck capital of the Atlantic, as it is surrounded by hundreds of shipwrecks. Many ships lie in shallow waters, providing shelter to a vast number of fish. 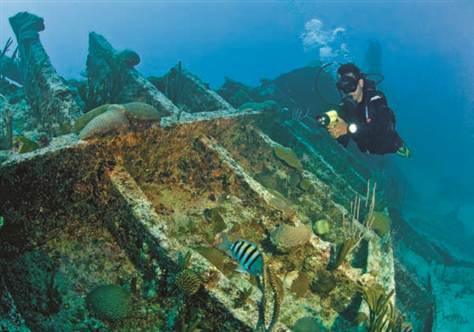 The majority of these shipwrecks are now very popular dive sites. 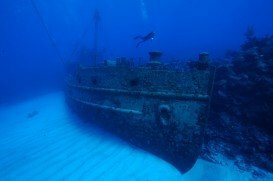 The Pelinaion is a favorite location for divers, because of its large size and massive parts, including its huge steam boilers, deck winches and a spare propeller that is strapped to the deck. 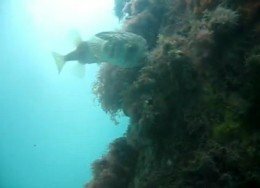 The Pelinaion was a cargo steamer that sank off St. David’s Head in 1940. Nowadays, it lies scattered in 6 m/20 ft – 21 m/70 ft of water. The bow sits on the reef at a depth of 9.1 m/30 ft and the stern lies in 21 m/70 ft of water. 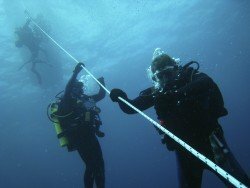 The visibility of the site is good, ranging from 10 m/32.8 ft to 30 m/98.4 ft and the water temperature varies between 19 °C/66 °F and 26 °C/78 °F. 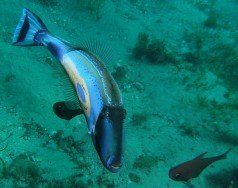 In addition, divers are able to witness a spectacular marine life, such as barracuda, blue angel fish and large schools of snappers and grunts. Note that the ideal period to visit the spot is during spring and fall months. 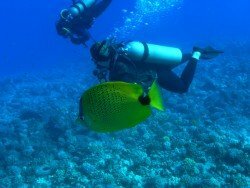 Last but not least, the site is suitable for both the beginner and more experienced diver. Lake Huron is the third largest freshwater lake on Earth. Its lake shore is 3827 mi/ 6159 km long and the average depth is 195 ft/ 59.4 m. Lake Huron and Lake Michigan have the same surface elevation and are technically a single lake. The Straits of Mackinac connects Lake Michigan and Lake Huron. Many ships have sunk in the Straits, due to storms over the past years, some of them yet to be found. 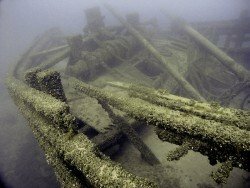 The Straits of Mackinac Underwater Preserve tries to preserve Michigan’s shipwrecks. 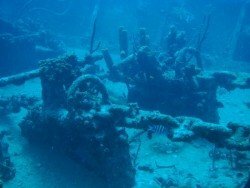 The preserve contains more than thirteen recognized shipwrecks. One of them is the Martin Stalker. 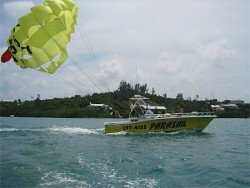 Barbados is one of the Caribbean's popular destinations. 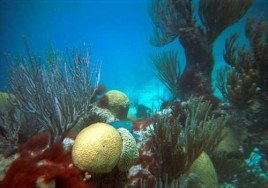 It's located on the eastern side of the Caribbean and west of the Atlantic Ocean. 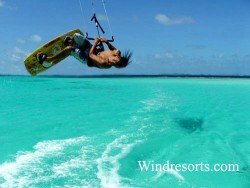 It is also lying east of the islands of Saint Vincent and the Grenadines. Its capital city is Bridgetown.